One of the big stories of 2014 has been Sting doing business with WWE. It seems inevitable that this is leading to him wrestling at WrestleMania 31, possibly in his retirement match, ending a near 30 year career with his first WWE match. There are very few, if any stars of his magnitude left that didn't have a single match under the WWE banner. Most of the other obvious cases are dead, nominally retired, or too old/injured for WWE to do anything with them. In spite of that, a lot of the biggest stars in modern wrestling history DID pass through WWE at one point or another, but had short stays, came in for a one-shot deal, didn't appear on TV, or otherwise aren't really remembered as ever being WWE talent even though they were. So let's count down some of the biggest stars in wrestling history that you may not have known were in WWE. 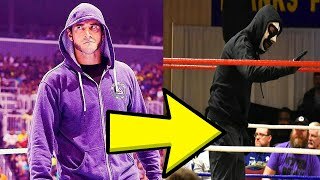 https://www.youtube.com/watch?v=fG5ONc6aWac In 2005, it was clear that CM Punk and Samoa Joe were both going to make the move from Ring of Honor to a bigger promotion. Punk was clearly going to WWE since he was very public about hating TNA, but Joe was a question mark. When he heard rumors that WWE was signing him just to bury him, he opted for TNA and has been a mainstay ever since. He did wrestle on WWE television once, though: In 2001, when he was just a southern California indie guy without much of a name, a young, slim Joe took on Essa Rios. This was during a period where a lot of indie guys got showcase matches against cruiserweights like Rios, and it's a pretty fun match, though Joe doesn't look like the world beater he became later. Formerly the site manager of Cageside Seats and the WWE Team Leader at Bleacher Report, David Bixenspan has been writing professionally about WWE, UFC, and other pop culture since 2009. He's currently WhatCulture's U.S. Editor and also serves as the lead writer of Figure Four Weekly and a monthly contributor to Fighting Spirit Magazine.